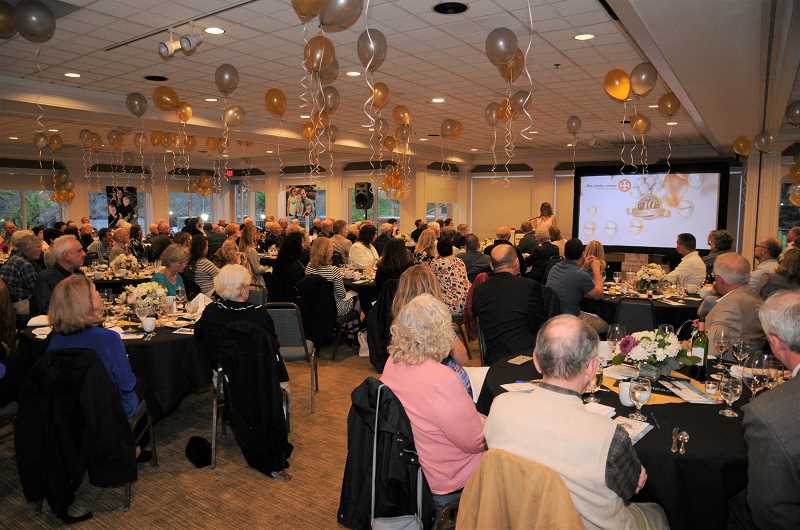 Camille Hall, whose life has been 'riddled with many obstacles' shared her story of overcoming and how the Canby Center helped her in that at the Canby Center's annual fundraiser celebration on April 13. Here is her full testimony. "My life has been riddled with many obstacles, from life threatening medical conditions that began at birth. I was born with an upside down heart actually, and that caused an open-heart surgery at three months old that I was expected not to live, and I survived that but along with other health issues as a child. "All of that changed though in 2003 when I rededicated my life to the Lord." "I was brought up in a very dysfunctional home, being forced to marry at age 16 into a very abusive marriage. I finally escaped that about age 20. I started rebelling against my family and God. I lived a very carefree, arrogant, sinful life for many, many years. All of that changed though in 2003 when I rededicated my life to the Lord. Sorry, this is very emotional for me tonight. "I met my husband in 2008 and we married in 2009. And everything was wonderful, but in 2010, we also lost a baby. Then in 2012 we were dealt with another crippling blow when I was diagnosed with fourth stage heart failure out of the blue. Come to find out I had contracted a serious bacterial infection that got on my pacemaker and went directly into my heart. So it nearly took my life. I had a less than 3 percent chance of living. I did live, thank you Lord. But at 39 years old, I lost my leg and my right toes. "At that time, we were really sad, obviously, and we were wondering if things were ever going to get back to how they were. But after a long painful recovery, we decided we needed a fresh start, so we moved to Canby. That was in 2014. As we were moving, a lot more obstacles came along. We were late moving into our apartment. They were late having it ready for us, is really what it was. And it was summer time and I had contracted another infection. So, we were forced to spend every dime we had and stay in hotels until the place was ready. We had nowhere to go, we had spent every penny we had in savings. "They...encouraged and reminded us of our own self worth--that we are not victims, but we're victors." "So my husband began asking the community, where would be a good place? And they said the Canby Center, thank God. So we went into the Canby Center, not knowing what to expect because we didn't know this community, and we had been so broken by that point. But we remember Linda, and she was there just to listen to us. I told her I'd cry. I gave her warning. She was there just to listen, but then she gave us so much more than that. She truly loved us. She also helped me on how to make a budget work. When I was hospitalized losing my leg, I had seven strokes and a bunch of pulmonary embolisms, so my brain was not all there, so she really helped me get on track again. They also gave us assistance on our electric bill, with food, with clothing and encouraged and reminded us of our own self-worth—that we are not victims, but we're victors. "Although everyone there is wonderful, I would like to mention a very special volunteer, and her name is Cindy. Every time we would visit, Cindy would jump to her feet, greeting us with a smile and a hug. She and Linda will never know how much they helped open our hearts again. "We now look forward to a futre, our bright future; and I share my near-death experiences along with many other stories of God's grace every chance I get." "The Canby Center is truly the place where hope started for us again. I'm happy to say that much has changed since then. My health has improved greatly, with many healing miracles. Our finances have greatly improved also, as well as our overall being thanks to the Canby Center and what they've done for us. We now look forward to a future, our bright future; and I share my near-death experiences along with many other stories of God's grace every chance I get. I enjoy telling people not to give up and to mentor younger girls and to help them to stay strong and remember to persevere, especially when life seems so hopeless. "Jesus' love is the reason I'm alive, and the Canby Center is a great example of that love. The reason the Canby Center exists is thanks to the support of this wonderful community, and I would like to personally express my gratitude to all of you here tonight."